When last I posted here, I said I would post again when I had some idea of Louise's return date. That was over two weeks ago, and, at this writing, she still has no return ticket nor a clear notion of when that might be. Two weeks is a long time between blog posts, and some folks have inquired as to our well-being, so I thought I should post an update. 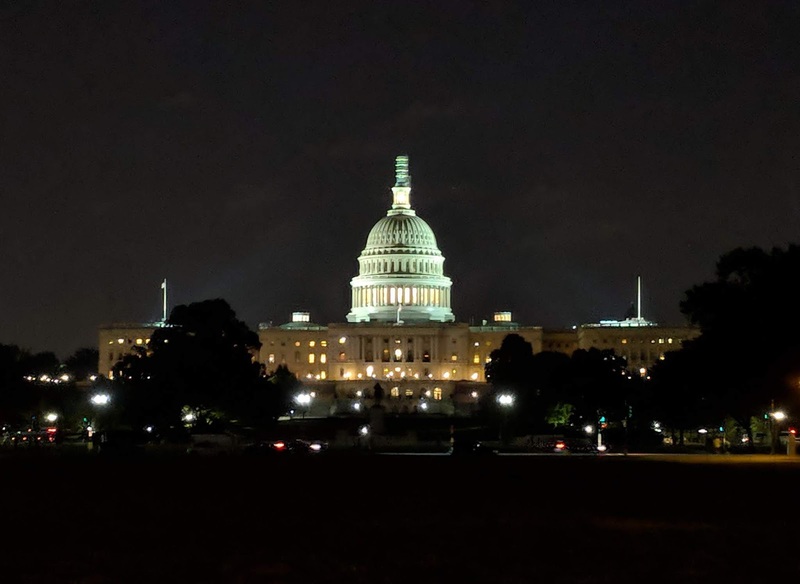 The Capitol at night. I snapped this mid-Mall, about abreast of Air and Space. Before I get into the more mundane, let me just say that yes, we are both well, as is Angel the cat, and the boat is also fine, if a bit more encrusted with marine growth. I am anchored in the Washington Channel (map), where we dropped the hook on our arrival. I now have two neighbors, a pair of sailboats a bit to my south. 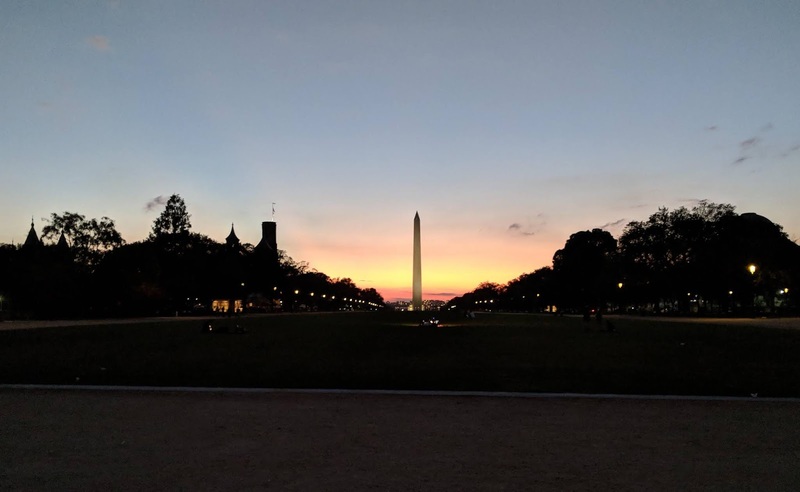 Washington monument at dusk, as seen from the National Mall. Smithsonian Castle is on the left. We arrived in the channel around 4pm, and cleared in with the harbor patrol as required. 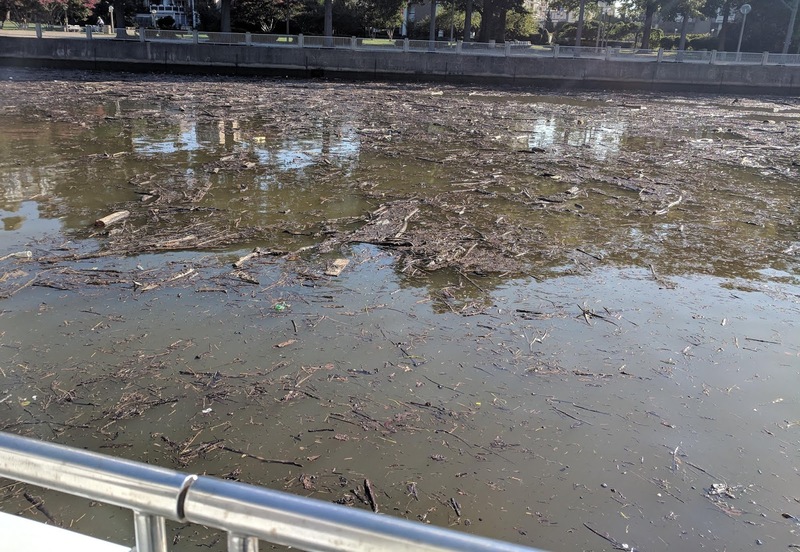 We were surprised to learn that the anchorage is now restricted to an area designated by four new yellow buoys just south of the police dock. We knew from reading cruising notes that anchoring north of that dock is no longer allowed, but these buoys are newer than even the most recent comments. Fortunately the anchorage was completely empty when we arrived. The buoys delineate an area perhaps just under 200' wide by maybe 800' or so long. 200' is basically the diameter of our swing circle in this 15-20' depth area, so the anchorage now has room for three or at most four cruising boats. We chose a spot at the northernmost end, to minimize the wakes and our dinghy ride. 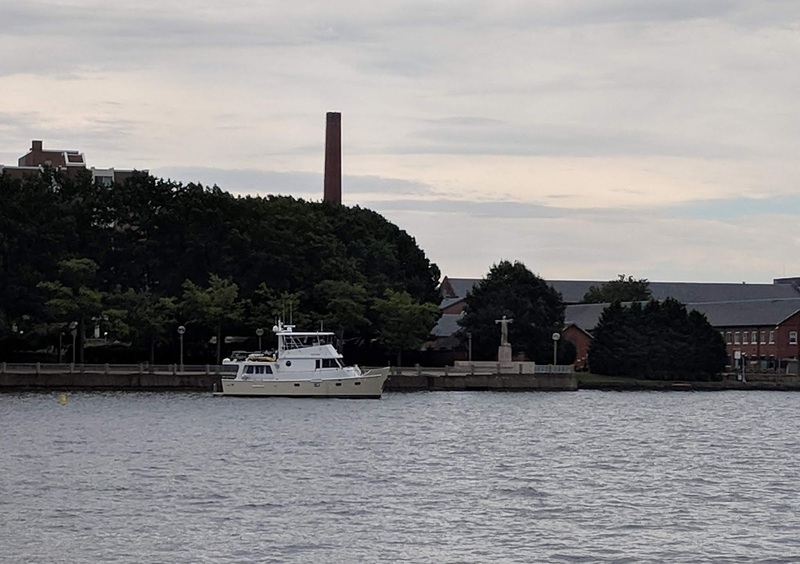 That puts us immediately adjacent to the Titanic Memorial. 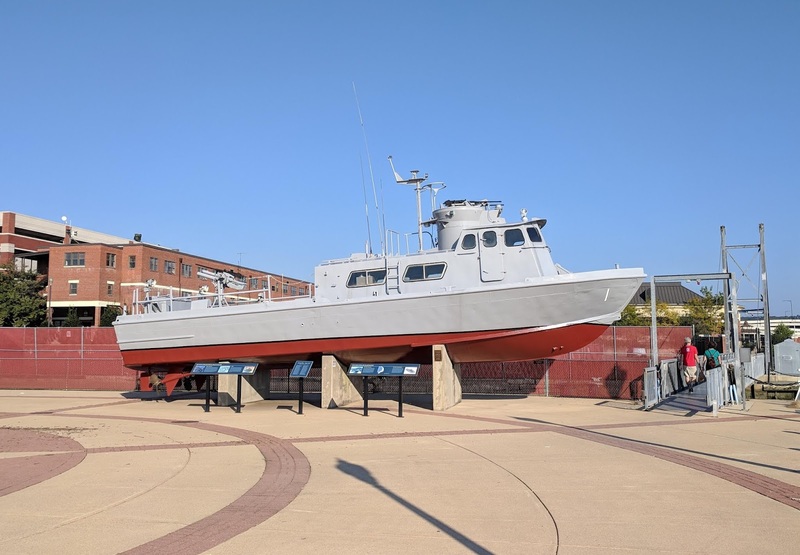 Vector next to the Titanic Memorial. Smokestack is on Fort McNair. We splashed the tender right away and headed ashore. Capital Yacht Club dockmaster Kelvin met us on the dinghy dock with a pair of card keys and a folder of information. We would have immediately headed upstairs to the club bar for a beer, except it was closed for a private event that evening, so instead we crossed the street to Kirwan's pub, part of the enormous new District Wharf complex. This dining, retail, entertainment, office, and residential mixed-use development has been open just a year. When last we were here it was basically a big hole in the ground, with workmen setting foundations while pumps extracted water from the whole shebang. 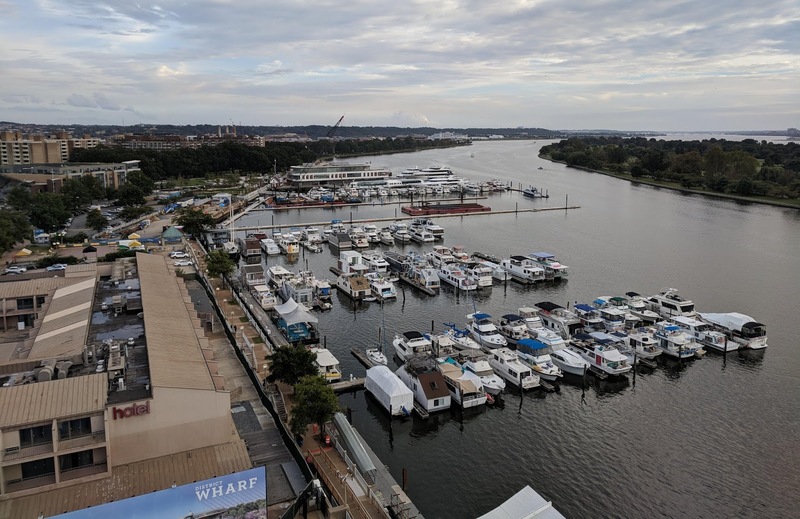 The yacht club was working out of temporary quarters in an abandoned hotel, which will be removed shortly as part of phase two of the project. Vector as seen from the Titanic Memorial. Wharf complex is at right, Washington Monument in background, and one of the ever-present construction cranes that dot the city. After our beers we strolled around the complex for a while taking it all in. It was incredibly busy on a very pleasant weekend evening. Apparently the whole concept has been a resounding success; the place has remained busy and vibrant the whole two weeks I've been here. On the weekend there were musicians performing at various spots throughout the complex. In short order we found there to be a CVS pharmacy, handy for milk and other last-minute items, a full-service hardware store, District Hardware, which quirkily sports a cafe and a bicycle sales and repair business within, a huge and popular music venue called Anthem, three upscale hotels, and perhaps a dozen bars and restaurants. I later learned there is also a marine supply store, Anchor, which also sells craft beers and nautical fashions. 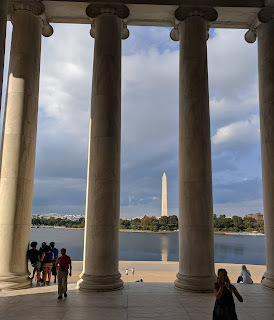 The Washington Monument across the Tidal Basin, as seen from the Jefferson Memorial. There are also quite a few public spaces, including the "recreation pier" where paddlecraft can be rented and which sports a gas-fired fire pit at the end as well as swings all along the pier, a more traditional wood fire pit shoreside, a number of outdoor stage areas, plenty of seating, and bicycle racks. There are transient docks for hourly visitors at $30 for three hours. 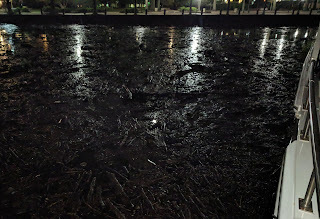 and even overnight docks. We ended up at the upscale pizza place, Lupo Marino, for a casual final dinner together. It was ok but we won't be going back. Lots of better choices right here at the wharf, and certainly less expensive options further afield. We made it home before the channel closure for the fireworks, which we could just see above the tour boats docked upriver of us. 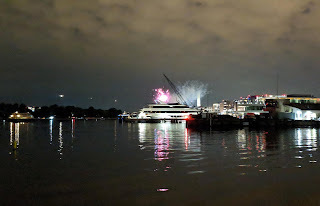 Fireworks from The Wharf, their smoke veiling the Washington Monument. 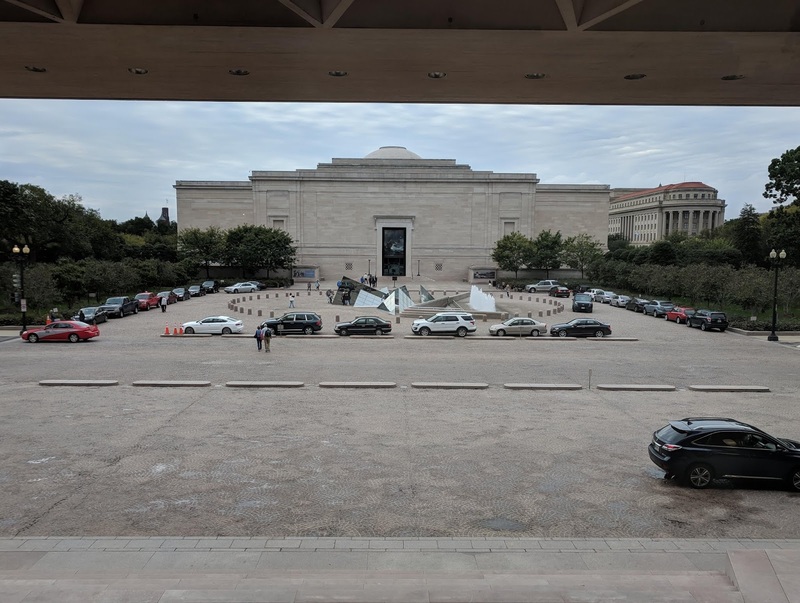 In the morning we called a Lyft to get over to Reagan National Airport, which is close enough to the anchorage that we can read the tire expiration dates on arriving aircraft. We had hoped to catch breakfast together but there we no real good options ahead of security, so Louise continued on toward her gate, and I strolled through the historic older art-deco sections of the terminal before getting on the Metro to head home. Only later did I learn that one of the services offered by The Wharf is a free shuttle bus to the L'Enfant Plaza Metro station, which would have made getting to the airport on the Metro a slam-dunk. 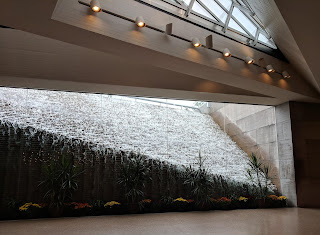 I spent a little time wandering around L'Enfant plaza as well; I stayed in the hotel here as a youth and I was hoping it had been re-opened, but is has not. It has been closed since before our last visit three years ago. After getting billing squared away with the club office, picking up a couple of packages including our accumulated mail (which had already made a round-trip to Port Washington, NY), and learning about the free shuttle, I returned to Vector to settle in to bachelorhood. At least until returning ashore at cocktail hour for my first of many beers at the club bar. 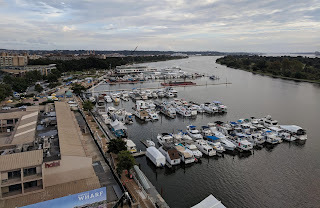 Gangplank marina, tour boat piers, and the Wasginton Channel as seen from the roof of the Hilton Canopy hotel at The Wharf. Vector is barely visible center frame past the tour boats. My first couple of days I did some walking around the district and took in a couple of museums, notably the National Museum of African American History, which was not yet open on our last visit. I found it very moving, though not as much so as the Civil Rights Museum in Memphis. 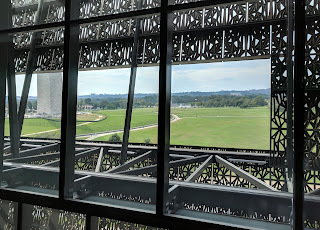 The Washington Monument and surroundings as seen from inside the National Museum of African American History. A side note here may be in order. 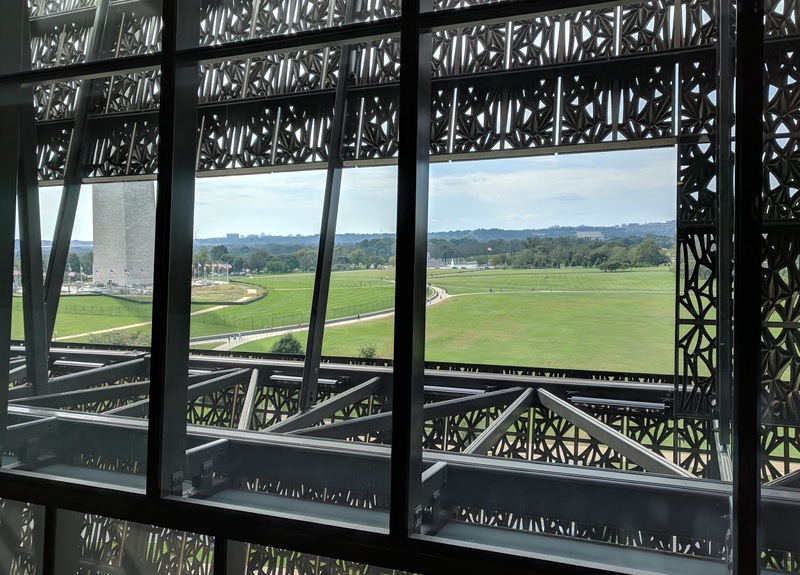 Long-time readers may know that Louise, with few exceptions (such as the aforementioned Civil Rights Museum), does not do museums. That's because it is very, very hard on her chronic plantar fasciitis, a lifelong condition. Sometimes we'll breeze through a museum together quickly -- we had to miss Martin Luther King's room in Memphis, for example. Sometimes we'll rent or borrow a wheelchair. Mostly, if there is a museum I want to see, I do it alone. 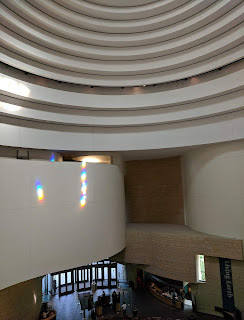 The atrium of the National Museum of the American Indian. Prisms in a sunny window cast the rainbows. And so it is that, with Louise away, I set a fairly ambitious (or so I thought) schedule of museum visits. I wanted to see the African American one, with an eye to whether or not we should come back together. Another newer museum that we missed last time is the National Museum of the American Indian, one we thought might be redundant for the numerous native American cultural sites we've visited in person. And it's been a very, very long time since I was in the National Galleries. 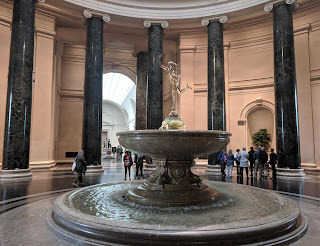 The rotunda of the National Gallery of Art (west building). An eighteenth century copy of a sixteenth century bronze, Giovanni Bologna's Flying Mercury, graces the fountain. I grew up with this statue; a nineteenth century copy is prominent in the lobby of The New York Athletic Club, where I studied fencing, among other sports, for years. While the weather had been absolutely perfect and the museums were calling me loudly, an issue aboard Vector that had been growing ever more pressing in the last couple of weeks reached a nadir that diverted my attention for two full days. 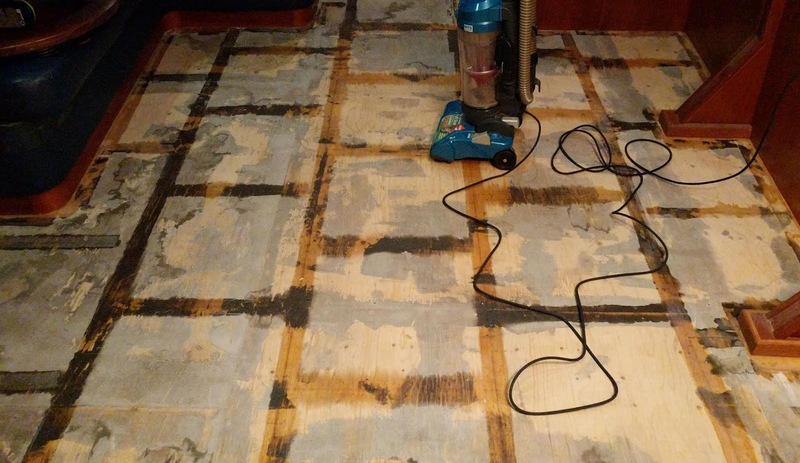 To wit, I had to replace the flooring in the saloon. There is a very long story here which I will try to distill down to just a couple of paragraphs, that starts with a cat with but one kidney. Readers who have been following along will know that Angel has bee in and out of vets with this issue, culminating in a very expensive emergency visit in New York wherein we were nearly certain we would have to put her down. Hydration, in the form of subcutaneous fluids, has always been the key to her recovery: for her entire life, she has not been drinking enough water. Her drinking behavior has also been bizarre, with a compulsive need to slap the water with her paw before drinking. The only DaVinci in the Americas, Portrait of Ginevra de' Benci, in the National Gallery. In a last-ditch effort to stave off further kidney damage and a certain demise, we bought her a fountain. Instead of a water bowl, she now drinks from this fountain, which not only provides audible and visual stimulation, also brings the water closer to her head. It has made a huge difference, and her water intake has gone up several fold. The difference in her health has been nothing short of miraculous. What goes in, though, must come out, and in addition to dramatically increasing her intake, it has also dramatically increased her output, and therein lies a problem. In spite of having added some time ago a second litter box in the saloon, she has been occasionally going on the floor in a handful of spots. And once a cat has marked a spot, there is almost nothing one can do to keep them from going there again. 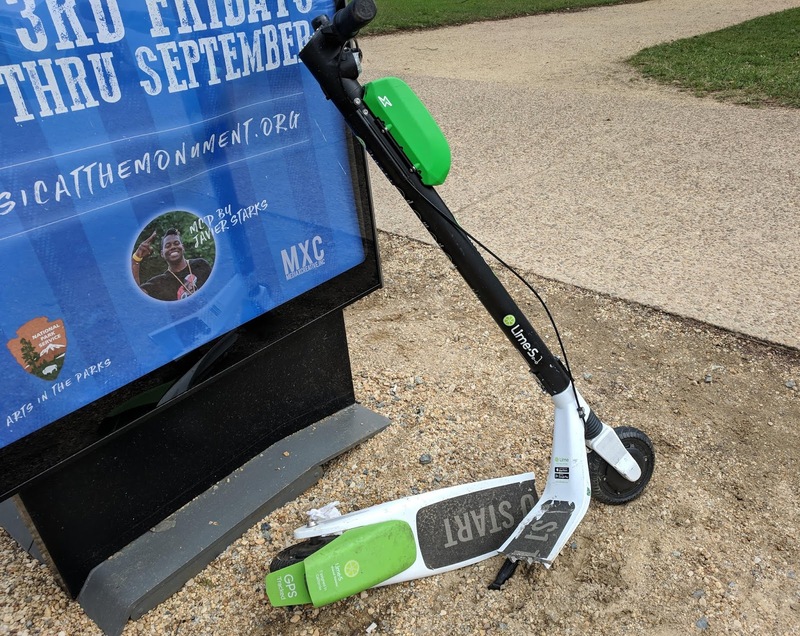 Washington is allowing a limited number of dockless electric rental scooters during a trial program. This one, from Lime, was abandoned broken in half. Users seem to leave them in the worst places, I knocked one over just walking on a sidewalk. No, I did not pick it up. 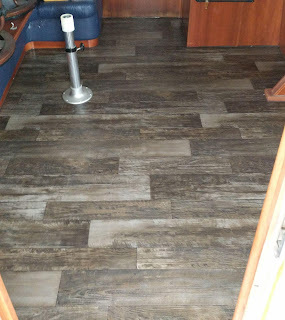 Way back when we ripped all the carpet out of the boat in anticipation of cat accidents, I installed woven vinyl flooring in the saloon. It looked great, it felt great, the cats could not really damage it, and it was fairly easy to clean up small accidents of various bodily fluids. But the texture meant it had nooks and crannies, and fluids can and did make their way between the tiles and into the plywood subflooring. The problem reached a tipping point as we were leaving NJ, and we've tried everything we could think of to mitigate it. Louise actually stopped sitting in the saloon weeks before she left. I'm less sensitive, but it became intolerable for me, too, in spite of myriad applications of enzymes. And I knew if I did nothing to put a stop to it, we'd never get it out of the subfloor, a very expensive proposition. As we were headed into the Potomac, we resolved to get to the store and buy a single piece of impervious sheet vinyl flooring to deal with the problem. I had to close off the saloon with plastic sheeting during the project, to keep the cat out and the dust in. With Louise gone, that plan was not going to work. 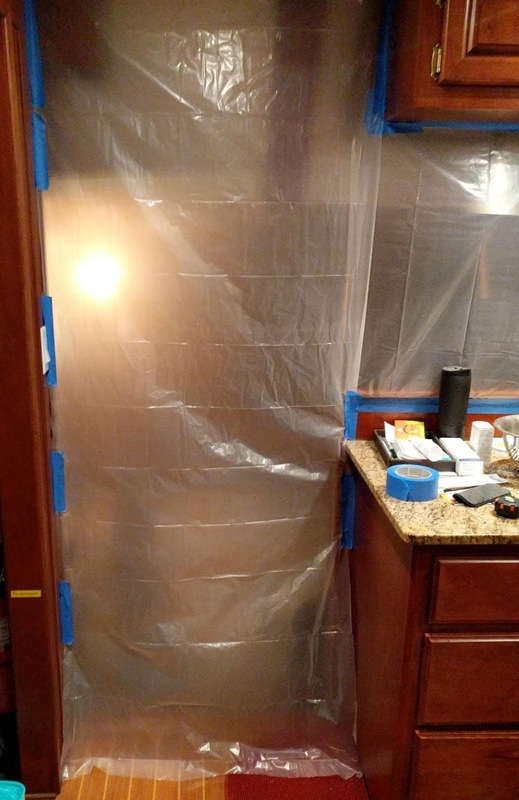 Instead, I ended up buying two smaller pieces, which I bridged with clear shipping tape to form an uninterrupted waterproof barrier. These cut rolls are essentially factory remnants, and I had to settle for whatever they had; fortunately I found two pieces of the same pattern, which, while a bit dark, is not out of place in the saloon. It took me most of an afternoon to go out to Home Depot on the Metro and schlep the two six-foot-long rolls back home on my shoulders, along with a backpack full of caulk, sandpaper, and other necessities. Subfloor exposed. The adhesive tape left these wet-looking marks. Pulling up the old floor along with some of the double-sided tape that held it in place, cleaning the subfloor, sanding down the plywood in the worst spots, and deep treating it with enzymes took a full day. The next day, after the enzymes had done their magic, I cut, positioned, installed, and seamed the vinyl, sealing the edges with a thick bead of silicone caulk. It looks acceptable, and at some point we will replace it with something more appropriate in a single uninterrupted piece. The two cut remnants cost me just $50 total, so I won't mind throwing it away when we get something nicer. Finished flooring installed. The seam is almost unnoticeable. I'm not the flexible and energetic young man I once was, and this kind of project now takes a lot out of me. I ended up spending most of the next day recuperating in my easy chair. And so it is that the saloon floor took a full three and a half days out of my otherwise leisurely schedule. I am happy to report that it's working as intended; the cat did spend a full day poking around and wondering what happened. 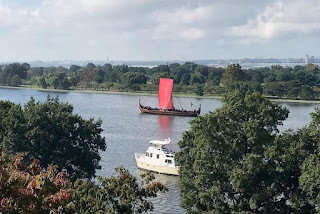 Somewhere during the great flooring project I was aroused by some commotion outside, which turned out to be the much-hyped arrival of "the Vikings" in the Washington Channel on their way to The Wharf. The arrived under power but stopped south of me to hoist the sail, to very little effect and they took it right back down before even arriving at the dock. But they passed me with the sail up and I snapped a few photos for the blog. Later I was given a much better photo taken from the sixth floor of the apartment complex behind me, with both the Viking ship and Vector in the frame. The ~35 member crew of the Draken Harald Hårfagre have been using the showers and other facilities at the Yacht Club. Conditions on the ship are rustic (we're Vikings, darn it), lacking showers and with only enough berths for the crew to hot-bunk under way. They've been selling tours at $16 a pop to hundreds of tourists, and the stage pier has been full of booths selling tickets and souvenirs and showing construction videos. I know the young multi-national crew have signed on to something allegedly more noble, but it's hard not to view it as little more than a floating cheesy tourist attraction. They left last night after a full ten days in port. A Swift Boat on display at the Washington Navy Yard. To the right is a pedestrian drawbridge that carries the Anacostia River Trail over the Yards small channel. 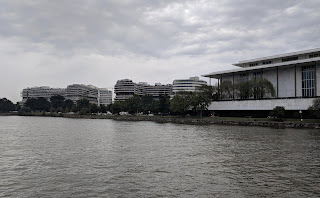 I did ultimately resume museum-hopping, along with walking along some of the more picturesque parts of the district. 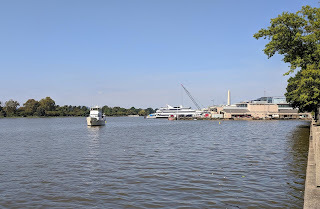 I even offloaded my bicycle, riding it past Fort McNair and up along the Anacostia River past the Washington Navy Yard, staying as much as possible to the fairly new (and thus incomplete) Anacostia River Trail. 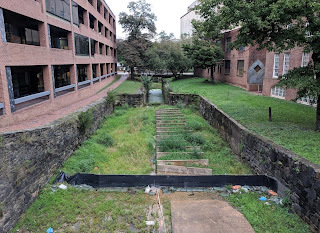 That part of the district is undergoing considerable urban renewal. 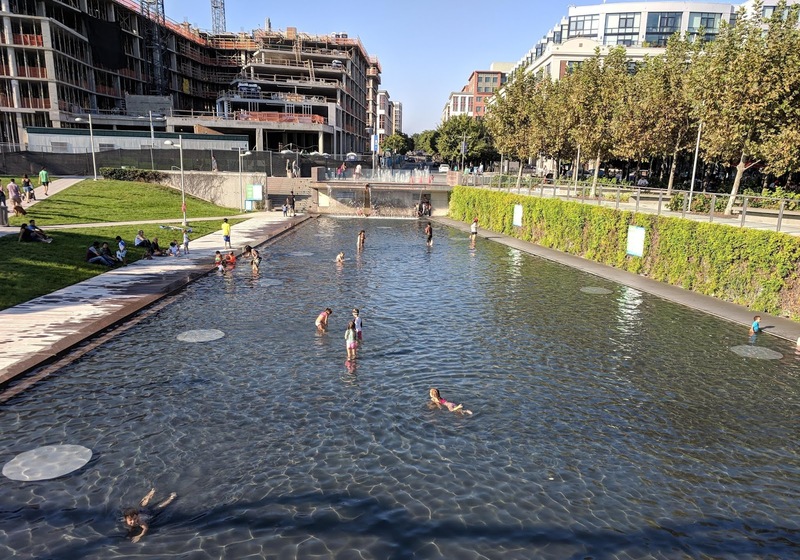 This nice wading fountain is in Yards Park on the Capitol Riverfront near the Navy Yard. 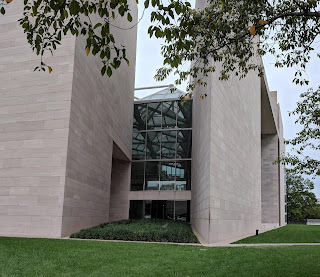 In my travels I did make it to the American Indian museum as well as the National Gallery of Art. In both cases I found the museum architecture at least as interesting as the contents. I also made a brief stop at my old friend the National Air and Space Museum just to see what was new and different. And I spent an afternoon at the Museum of American History, which always has something new and where I am always moved by some of the permanent exhibits like the Star Spangled Banner. 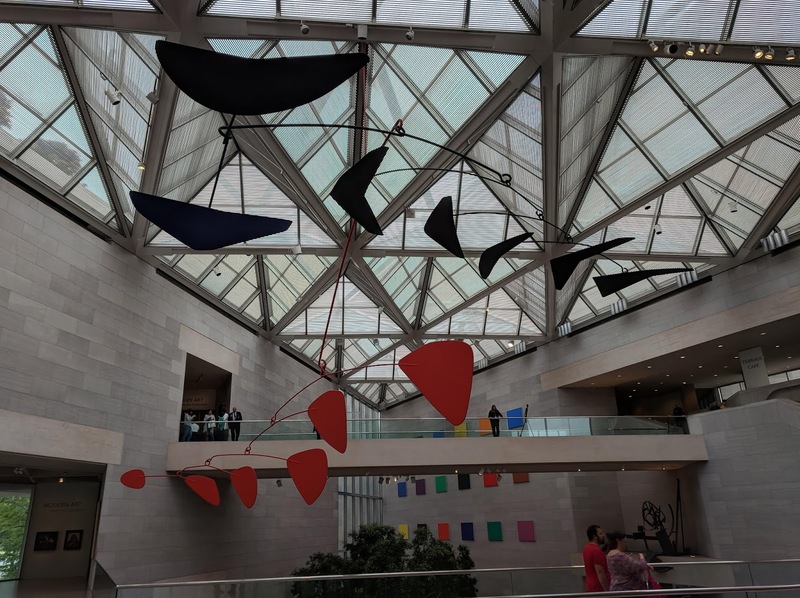 Fellow Stevens alum Sandy Calder is well-represented throughout the city, and a gallery is dedicated to him in the east building of the National Gallery of Art, where hangs this mobile, his last and largest commission. Late evening walks are also not usually on our agenda as a couple, and so I spent a few of the warmer evenings just strolling the capital at night and enjoying the monuments and buildings that are all carefully lit for dramatic effect. 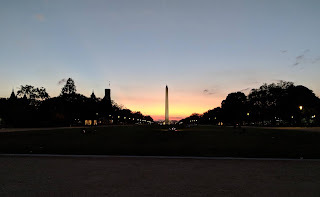 At one point in the evening as I was strolling the Mall, I was passed by no fewer than four groups of young runners in thundering herds, running at matched pace. I would guess some of the local college groups. Architect I.M. Pei was insistent that this sharp corner on the East Building be built as drawn, and not chamfered as engineers and builders wanted to build it. 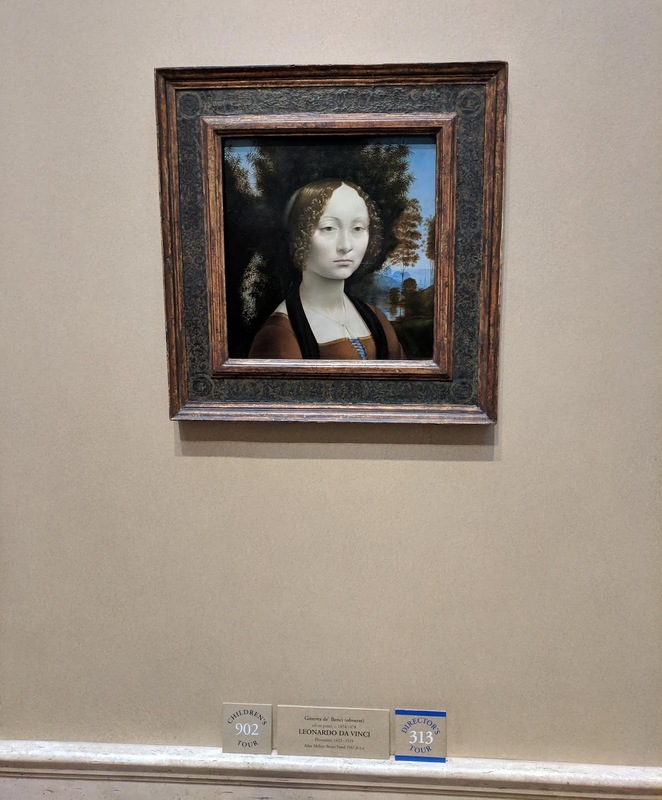 He took great delight in being vindicated later; the corner is still sharp, and the dark area on the edge from the touch of many hands attests to its popular appeal. 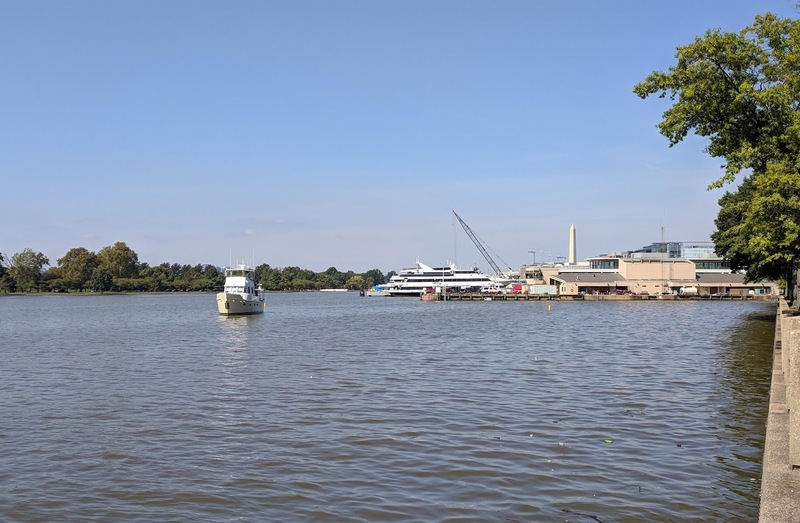 As part of The Wharf project a small dock has been added across the channel at East Potomac Park, more or less right by where we anchored on our last visit. Only non-motorized craft may dock there, but The Wharf runs what they call a "jitney" using a Duffy electric boat during daylight hours. I took the jitney across and strolled the park, discovering that the pro shop cafe at the golf course has the cheapest draft beer on the waterfront. I returned across the channel on foot, continuing on to Penn Quarter for dinner. A subterranean tunnel connects the east and west buildings of the National Gallery. This outdoor fountain appears to almost come into the tunnel, cascading just inches from the window. Pyramidal skylights above bring light to the underground cafe. With only a couple of exceptions I have been eating dinner ashore each evening; some days it's the only time I get off the boat. I've been keeping to our tradition of lunch aboard, which for almost two full weeks meant working my way through the salad fixings that we had brought aboard for the two of us for a more leisurely cruise up the Potomac. Nothing spoiled but I will have to throw away the cherry tomatoes Louise bought for herself, which I don't eat. That same fountain and skylights, as seen from the east building looking at the historic west building. Our anchor is well-set, and other than a police or fireboat screaming past from the station en route to a call, there's not enough wake or wave action in here to disturb my sleep. But I've been awakened twice in the middle of the night. 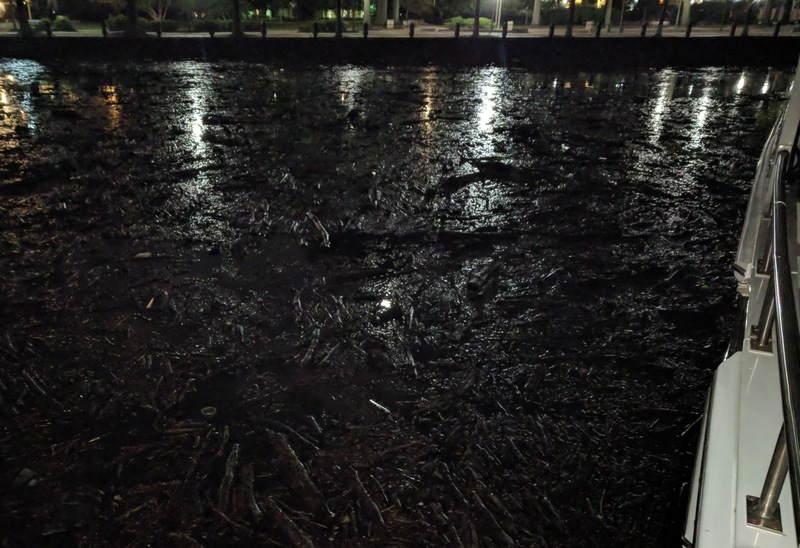 The first time was a veritable sea of wood debris knocking against the hull, brought in on the tide, and seemingly including every log we dodged on the way up. If the cat had gotten out she could have walked to shore on an uninterrupted blanket of wood extending all the way to the bulkhead. Wood from ship to shore, literally. The other time was when I woke to a considerable amount of rocking and came upstairs to find the winds had increased to 30 knots steady and gusting higher. I stowed a couple of things and put the safety line on the tender and went back to bed. When I woke in the morning the small sailboat behind me had dragged perhaps 500' down the anchorage, fortunately missing the other anchored boat and also stopping short of hitting the bulkhead. Had the wind been blowing the other way I would have had to spend the night watching him. I took another photo in the morning, but by then half of it had drifted away. As Louise's stay in California has drawn out, I've lately ventured a bit further afield. 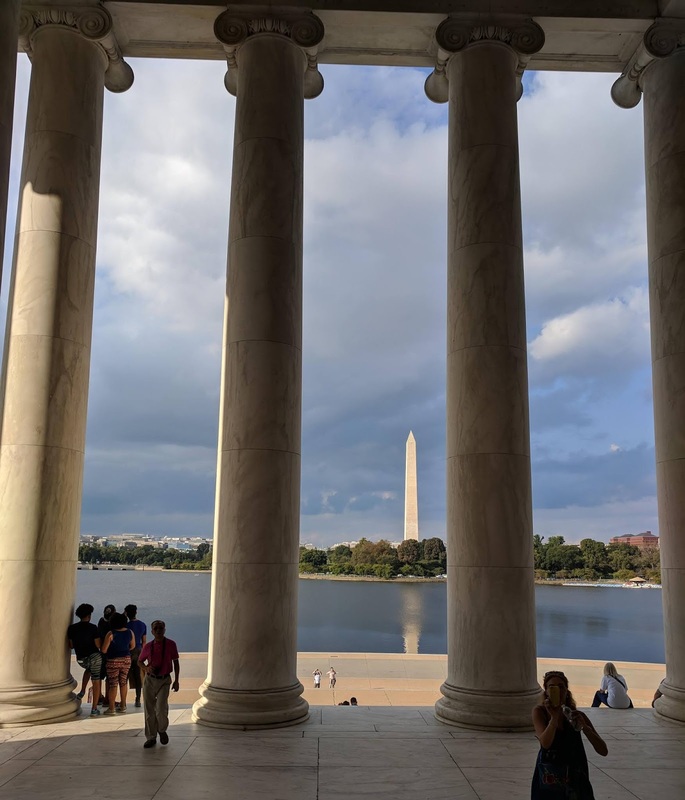 A couple of days ago I rode the Metro down to Alexandria, taking the free trolley bus down to the waterfront and then strolling the historic district. 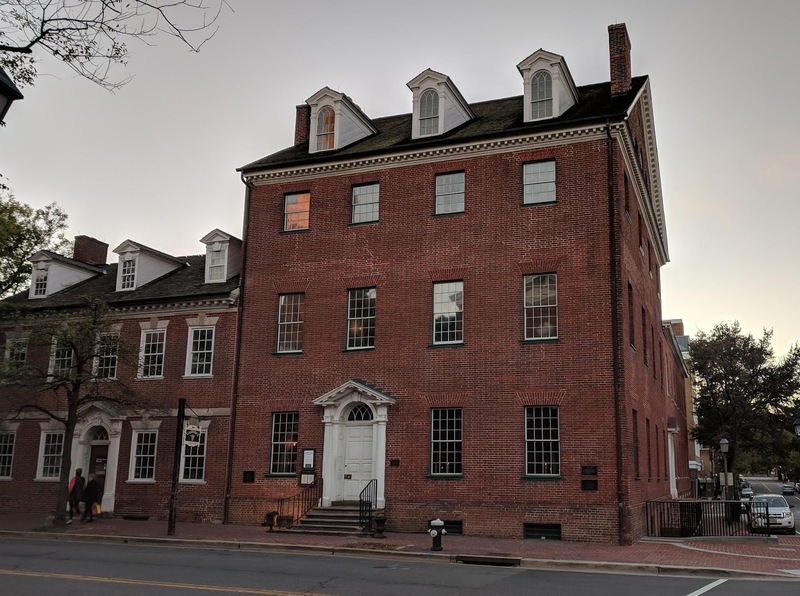 I dined at Gadsby's Tavern, where George Washington, among other prominent early Americans, once ate, before getting back on the trolley and heading home. 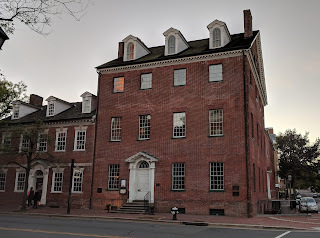 Gadsby's Tavern. Unassuming and easy to miss from the outside. Yesterday I had something of a boatman's holiday, dropping ten bucks on a Water Taxi ride up to Georgetown. I wanted to do that stretch of the Potomac, and Vector can't normally make it under the series of bridges en route. I was the only passenger on the 80 person ferry, and I ended up chatting with the skipper, also Sean, the whole trip. I spent the afternoon in Georgetown, where the historic C&O Canal is currently devoid of water while it undergoes restoration. I have a nice dinner at casual Italian bistro Flavio before coming back on the Circulator bus, a much more reasonable $1 per ride. Looking downstream on the empty C&O. Narrow section is a lock. When I am not gallivanting around DC, of course, I am working on the boat. In addition to the floor project, I also ended up climbing the mast to work on the satellite dish, which quit working right after Annapolis. I took it apart all the way to the board level, where I found two fuses and hoped to find one blown. They were both intact, though, and I put it all back together in defeat, resolving to get some help. When I turned the breaker back on it fired right up, so I can only conclude either the fuse/holders or the power connector were suffering poor contact due to corrosion. Conning tower of USS Balao at the Washington Navy Yard. 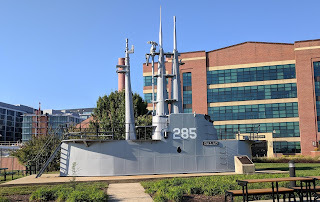 Balao was perhaps most famous for starring in Operation Petticoat as the pink submarine. At one point my shower seemed a bit tepid and I found a melted wire in the power connection to the water heater, which blew the fuse. The generator quit one day and I had to replace an impeller. And my laptop keyboard dropped a couple of characters so I had to order a replacement and install it with a hot-melt glue gun that I bought at the aforementioned full-service hardware store. I also spent the better part of a day repairing and reprogramming a damaged Android phone. While the weather here was absolutely gorgeous for over a week, dry and sunny with temperatures around 80, the cold front that has gripped much of the east has made its way here. Today barely made it into the mid-50s, perfect to stay in and blog, and tomorrow will be a last hurrah in the mid-60s before daytime temps drop into the low 50s with low 40s overnight. I was running air conditioning with the generator two weeks ago and now it's the heaters. Nothing in the long-term forecast looks to be changing that trend, and so when Louise returns we will take a couple of days for her to recuperate and decompress, perhaps have a nice dinner at the City Club in a belated celebration of her birthday, and then weigh anchor for points south. Between now and then I will get the boat squared away for travel and then tick off whatever else I can on my sights-to-see list. 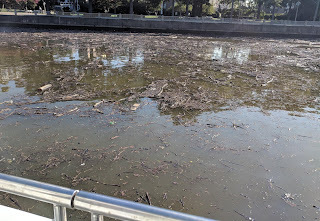 It's possible or maybe even likely that my next post here will be while under way in the Potomac. 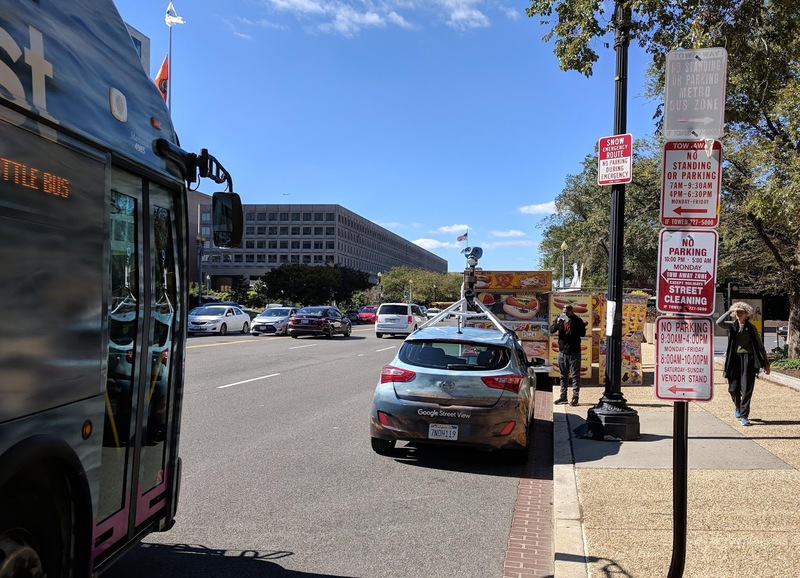 Google Street View guy gotta eat. Food trucks are ubiquitous here. That's the Wharf shuttle on the left. As a comment to Louise’s plantar fasciitis, I as an art teacher had it horribly, and it was awful for three years having to be on my feet all day on concrete. A friend recommended “Green Feet” inserts, and they were life changing. I have them in all my shoes, and no longer limp or have any pain. I have told 3 others about them, and they have had the same results. May be worth a try if she has not used them before. I too have had great success with Superfeet Green for the past 15 years. My 64yr old feet, back and knees can't go any distance without them. Hope they work for you.